Tonight is the first evening the City of Hoboken is facing the challenge of being largely without power. 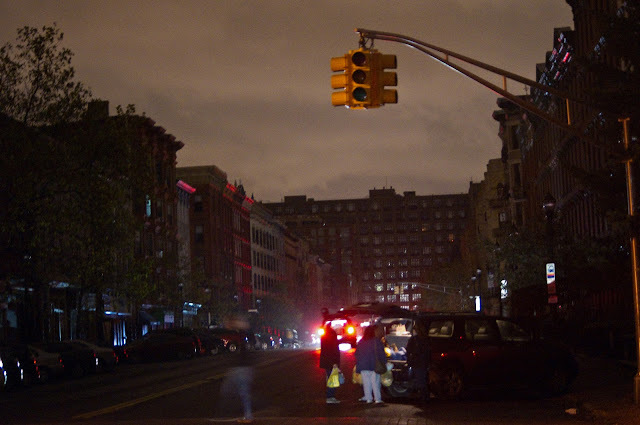 Washington Street was looking dark both uptown to the Hudson Tea Building and downtown without power. Looks like most of the City falls into that boat. Emergency vehicles are transversing regularly with their lights on. The store on the corner of 11th and Garden Street - Sacco's Deli looked to have power. If you are looking for something tonight, you may want to go over and see them. Otherwise, it looks like most everyone in Hoboken is going to be revisiting Bruce Springsteen's Darkness on the Edge of Town album. Halloween is unofficially cancelled and the parade tomorrow is off. If it's any consolation, there's no school tomorrow either. Sorry for lack of updates. We have lost Internet access again and it is difficult to send out information. Updates may be sporadic. We are doing everything we can. PSEG is working around the clock but power may be out for several days. They cannot restore power until flood water recede which may take 24-48 hours. We will post updates as we are able to. Volunteers can go to City Hall. Non-perishable food can be donated at City Hall. Washington Street north to the Hudson Tea Building is eerily dark except for cars and emergency vehicles.